You know, I really do enjoy making romantic and otherwise valentine's day themed cards. So, inevitably, I end up with a stock pile of love themed cards that just sit in my stash of cards. But, anyway, here's a card I managed to squeeze in tonight. It's for the sketch challenge over at SCS. Once again, I managed to bring in the All in a Row set. I thought it nicely framed the diagonal focal point. I had thought about using faux stitching, but this worked really nicely! Here's a creation with my recent favorite watercolouring set, And Everything Nice. I really liked how my one card turned out earlier with the red, yellow, and blue theme, so I wanted to try something a little more subdued. I'm really pleased with the pink, purple, light blue, and saffron look. I absolutely love watercolouring this image, it just always seems to work out for me. I didn't have any ribbon that matched exactly, so I went with the old, colouring the white grosgrain with the coordinating marker trick. I had been playing around with this layout with these stamps in my head for a while now. Today I finally decided to put it on a card. I coloured the main image with the markers, then stamped linen overtop. 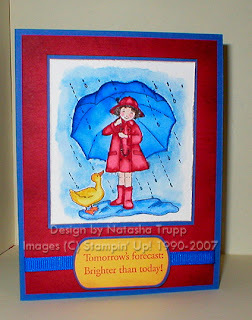 I love the faux texture that stamp provides, it really tricks the eye into thinking that it is special paper. 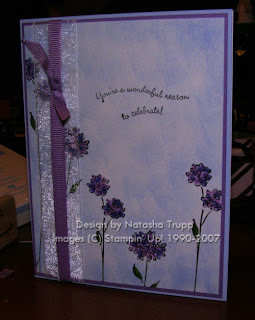 I stamped the other stamps in that set all over to make a collaged background. The side circles are mounted on top of some thin twill tape. I also went a little distressing-happy. I've found that of all the cheap versions of distressing tools, an x-acto knife blade that is no longer that good works great! It's better than destroying my nails anyway. Today my mom and I decided to do some window shopping, only we actually came home with a few purchases... We started out at one of the local scrapbooking stores, I didn't see anything that jumped out and shouted BUY ME, but I was really enjoying the Valentine's Day displays, all the rich pink and red items were lovely. However, I resisted. I was on the lookout for some velvet ribbon, but they only sell that by the metre, so I didn't feel like getting any. Next we went to Fabricland. 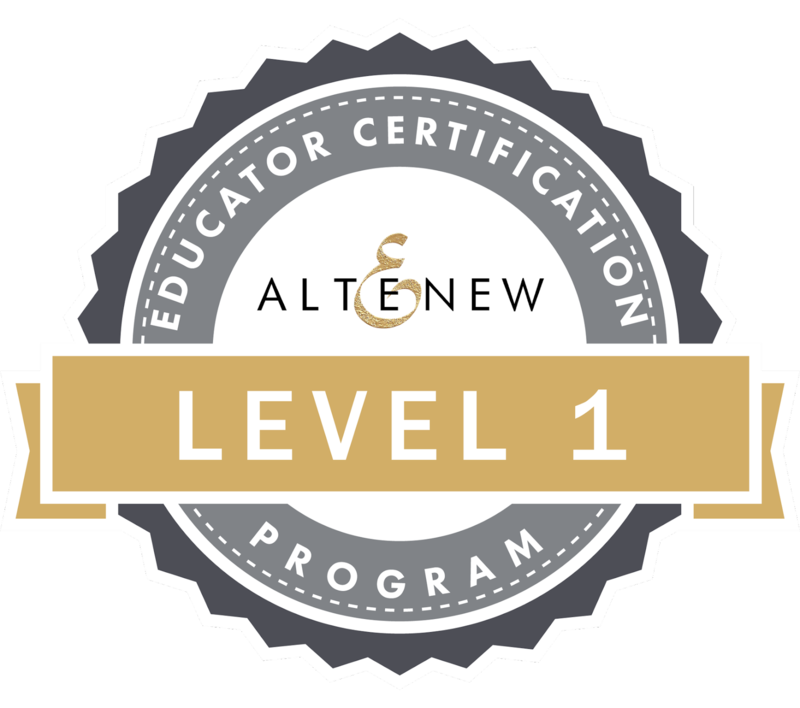 Immediately, I set off for the ribbon section. I found some pretty velvet ribbon, looked at the price, Ouch! $3.39/m for the mid-sized stuff. I wasn't too fond of that price tag. Then I heard my mom calling me over. As she always does, she found some awesome rolls of designer ribbon. There were grosgrain, organdy, picot, satin, AND velvet!!! They all are super nice. They had a little sampler tag and wow, is that stuff ever soft. 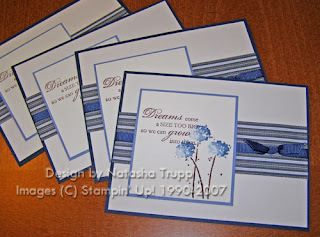 I hadn't yet come across grosgrain that was as soft as Stampin' Up! 's, but this stuff was. That's beside the point though, I have plenty of grosgrain, I do not of plenty of velvet ribbon. The price was 50% off 2-metre rolls that were $3.99 regular price (so $1.98 for 2 metres, not too shabby). So of course I had to use this precious new ribbon. 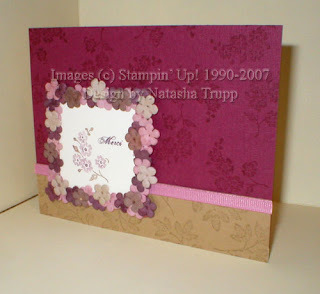 I love it, there's something magical about the texture of using velvet on your card. Here it is, I used Bothway Blossoms, a quote from Happy Harmony. 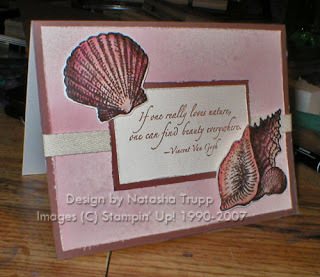 The background is made up of the Cherish stamp from Lexicon of Love. 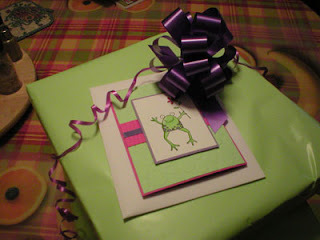 I needed a birthday card, but didn't really have time for anything elaborate, so I created this almost 1-layer wonder. I stamped the Bothway Blossoms, coloured them in with a mix of purples, then sponged bashful blue for a lovely sky backdrop. It was a bit too plain for my liking, so I added some white organdy and orchid grosgrain. This weekend I'll try to make some more interesting projects, I've just been a little short on time this week. I went to my upline's meeting, saw loads of ideas and swaps that she brought back from Leadership. One of them was this idea, I believe this was a make and take technique. Basically, stamp a lined image, then paint it in with reinkers and the aquapainter (I used markers), then smoosh it onto some paper. It gives it a really cool painted effect. You can use it alone or with the line-art image. 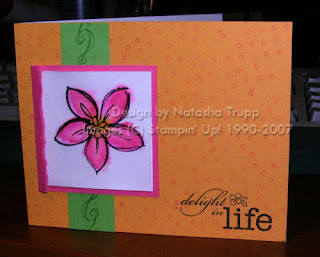 I used the Delight in Life set and some lovely bright colours; pixie pink, marigold morning, and green galore. C-Cake or Pie: Cake: brownies! J-January or February: January, birthday!! When I was talking to my sister briefly last night, I told her that I felt like watercolouring something. She said "do flowers" which is exactly what I was going to do. Then she said "use primas, and rhinestones". Although I couldn't fit primas into this design, I used 4 rhinestones, as well as one rhinestone brad. I used my make-shift ticket corner punch (a marked 1/2-inch circle punch), and placed the rhinestones in the corners with glue dots. The rhinestone brad is wrapped around the knotted organdy. I had to tie this first, carefully slide it off, then wrap the brad around it (I tried punching it through, so didn't work!). Then slide it back on. The watercolouring was done on some shimmery paper ( my free sample from Prism Papers). I had read that shimmery paper was a decent alternative to watercolour paper, so I thought I'd give it a shot. It paints nicely, but totally different, it's hard to describe. I used Still Life Stems here, I've been playing around with different layouts using the flowers. They are such tall images, so I've been trying to get the most versatility from them by using them in different ways. I love the look of the flowers in this set, I just hadn't had time to do anything with them. I figured I'd make a few for swapping at the Monday meeting at my up-upline's. 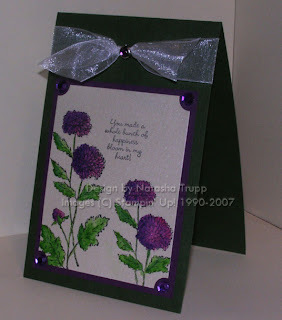 This is loosely based off of a card I did a while back with petal prints. I used the same colours, and a similar layout. It works well for making mass amounts, it also uses your 8-1/2x11 cardstock fairly efficiently with these dimensions, so that's always a good thing when making swaps! Here's a quick card that I just made. Very simple layout and colour scheme. I like using monochromatic colour schemes to fall back on, they pretty much always work! I stamped the worded background ever and over again. It was pretty easy to line up. 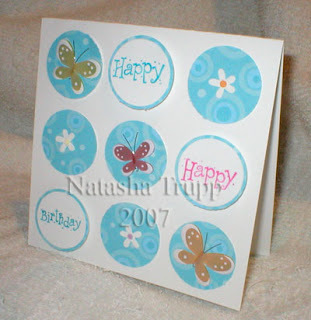 Then I stamped the big flower on the pumpkin paper, cut it out and stamped the little white dots on it. The circular 'cute' is popped up on a dimensional. Well, today I went out and bought a new digital camera. It's amazing. Although the one I received 5 years ago is still a fabulous camera, it just didn't have all that I would like from a camera, plus I've now spotted a 3rd burnt pixel (gasp!). This new one has 10x optical zoom. It is 7.1 MP, which is a bit much, but hey, now I can do prints at 8x10 or larger, should I choose (I'm sure I will). It also has digital image stabilization, no more blurry pictures!!! Also, and here's a fabulous selling feature, it will take up to 630 pictures per set of batteries/ rechargable batteries' life. Now, it does take 4 batteries, but that is hardly an issue for me, since the old one took 4 as well. It also has tons of preset scene modes and the ability for me to maually set aperature and shutter speed (once I figure out the situations in which I should be doing that). Like I said, it's amazing. I love photographing pretty much anything, so here's a a shot of my first experimenting with the super macro. 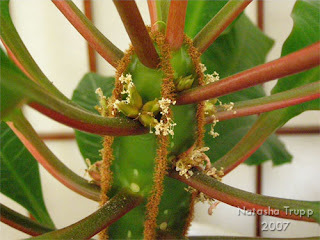 This is a plant in our livingroom (it's from South America, like most of our plants...). It's located in front of a decorative screen. I am definitely going to be having a lot of fun with this new toy! Sorry, I totally failed to mention the make and all that jazz (thanks Susan!!). I got an Olympus SP-510UZ. Our film camera was one, as is my older 2.0MP camera, so we just kept with that brand. We've had pretty good luck with Olympus, and this one just happened to have all the things on my checklist ( at least 5x optical zoom, a viewfinder AND an LCD screen, long battery power, digital image stabilization, turbo shooting, manual and automatic setting, and more!). If you're interested in this particular model or others by Olympus, here's a link to the website where you can check it out: Olympus SP-510UZ . Obviously, I am not affiliated with this company, just a satisfied customer of past and present cameras. 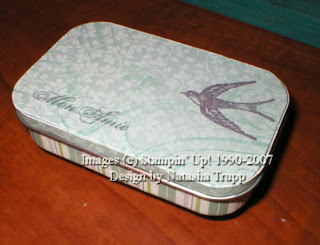 I know it was only a day of no new posts, but it feels long when I don't do any stamping. I was just really wiped yesterday. But the weekend is in sight, and I am feeling renewed energy. I made a card using Finest Flourishes. I got both the set and the brass template, so I used them together. 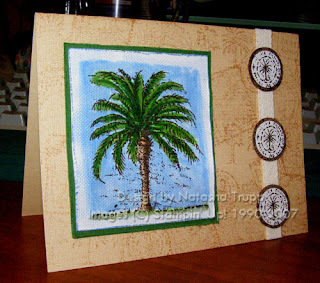 The background was made by dry-embossing 2 different striped papers, then piecing them together. 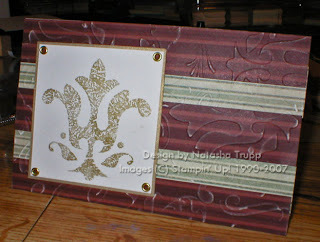 To emphasis the embossing, I gently rubbed the sanding block over top to reveal the patterned papers' white core. Well, I thought about creating something tonight, but I'm a bit tired. So here's a card I made yesterday. I really liked it, I posted it at the same time as my one layer card, and it didn't get nearly as much love, which is funny, because I like it more. By the way, I don't mean to devalue my time, but seriously, masking isn't a slow process. I had two masks going. Cut them too small, and it goes REALLY quickly. 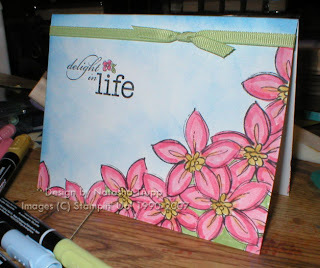 Also, the flower in Delight in Life is relatively simple, so cutting it out twice isn't too horrendous. 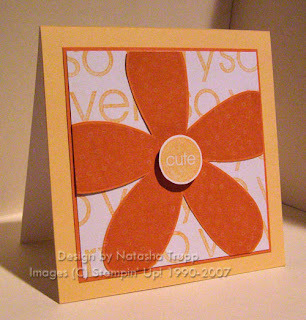 Another thing I noticed while stamping was that due to the sketched style of that flower, it's okay if you don't take the time to match it up right, it all works out. Same thing goes with the sponging. Just do a bit of sponging, move the mask, do a bit more, etc. I didn't make a mask for each and every flower!! Honestly, I was a bit overwhelmed when I checked my gallery today and the Delight card had over 300 views, and 24 comments. I guess it just goes to show you that you never know what will spark the most interest! Anyway, here's my underloved card. I like it, but perhaps its effectiveness is best seen in person. The shells are almost velvet-y and they puff out. Alright, there are 2 winners! 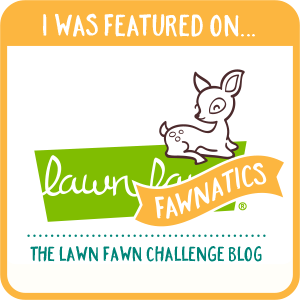 The first winner is for the Porcelain calendar, that one goes to #33, Amber! 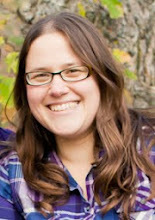 The second winner is for the Big and Little Pieces calendar, that one goes to #24 Laura J. If you two would email me at (Please note this is not a link, merely a text image) with your addresses so I can be sending these on their way! Okay, now for instructions. Like I said before, the calendar was made from a Windows Publisher 98 template: wallet calendar. I added 2 pages however to my template, one for the title page with just the year on it. The other with the spaces for name, phone number, and address. 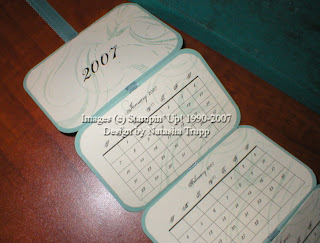 The calendar prints with crop marks and its cutout size is 3-3/8x 2-1/8. Next, I cut out 7 pieces of coordinating that were 2-1/4x3-1/2. I used the corner rounder on all of these papers. Next you need to line up the 7 panels very carefully. Get some thin stripped tape, and slowly tape in a straight line across all the panels. You use the tape to attach them all. Then get a very long length of ribbon (at least 17.5 inches per SIDE plus some extra). Attach the ribbon to this strip of tape. Make sure you can fold it all up accordian style before covering it up!! Next, stamp the calendars as you wish, then attach them to the panels. On the one side I put the title page, and January-June. On the opposite side I put the information panel, and July- December. Hopefully that paints a clear enough picture. It's quite an easy project, just lots of cutting and punching, and taping. I felt this post was lacking some "eye candy" so to speak, so here's a simple one-layer card I made tonight. 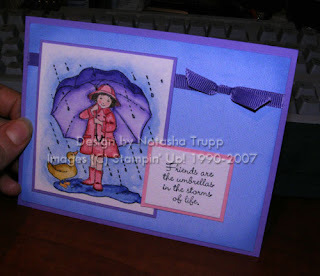 It's an interesting challenge, to make a card that has dimension without adding any other paper. This is just white folded cardstock. 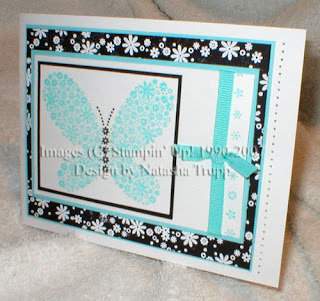 I know this isn't the most popular of Stampin' Up's sets, but I really liked it, and it fit into my "more line art" guidelines. 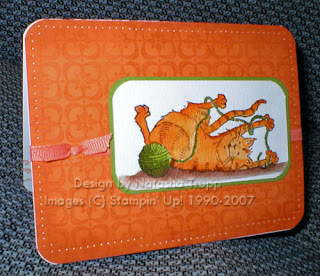 Plus, the stamp in this set where there are the line-up of 3 cats matches my cats. There's the spotted one (Jessie), the long-haired one (Gizmo), and the tabby one (Sammi). I also got this set because I plan on making one of my scrapbook contest entries with it. I was doing some prototypes for that tonight, and unfortunately I cannot share those, due to the strict rules of the contest. I'm pretty excited about how it is starting to turn out. But enough about that, here's my card. I kept it very simple and used a past colour combination as my inspiration: Pumpkin, Plive, and Chocolate. Because these colours remind me of all things retro, I HAD to use linograph. I still am so sad that linograph was retired after a mere year out there. I LOVE it. I didn't end up having quite as much creative time as I would've liked yesterday. I spent more time out of the house and then doing food preparation than I thought I would. I did manage to squeeze this one in. It's funny, I absolutely hated watercolouring in high school art, but when you already have your main image there, and it's not going to run, there's something a LOT more satisfying about doing it. Part of the reason I got the sentiment set Brighter Tomorrow, was for the this sentiment "Tomorrow's forecast: Brighter than today!". I thought it just HAD to go with this cute image from And Everything Nice. I went with the primary colours on this one, that's what the image screamed to me. Also used Weathered and Linen on the background to give it a near fabric-like texture. I sponged around the edges of the red with cranberry ink to further that texture. Weekend of Cards, part 1 & GIVEAWAY!! Now, on with the show...the first set I used was Very Punny. I made 3 different cards with it. Here's the first one I made. 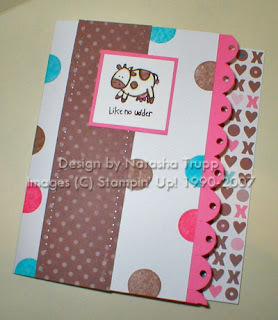 Since I was using the cow image, I went with my recent favorite colour combination inspired by the Loves Me paper. 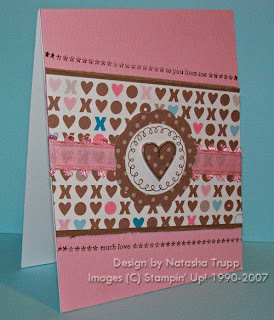 I also had fun adding the scalloped and punches border. This one was created with the slit punch, I used the 1/8 for the little punches within the scallops. Next I made this crazy card. Again, I went with the colours that were inspired by the animal in use. I chose the ladybug, so black and red it was! Once again, I used the slit punch to make the scallops around the main image. However, I used the corner rounder for the outside scallops. The big differences between these 2 punches is the direction and size. The slit makes a more bubbled scallop and if you want to use the scallops as I have, you have to cut them out and hide them under something. The corner rounder makes a more shallow scallop and you can use it to go around you entire piece of paper, very convenient. I like the look of them both. My last card uses the frog. I went with greens and dots. 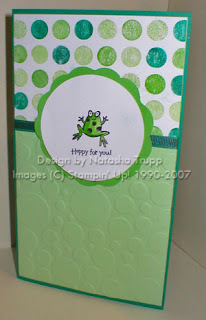 Once again, I did the spotty embossing on gable green. I paired that with a tri-coloured Dotted. 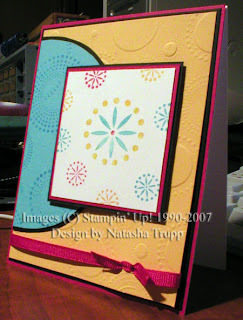 Once again, I used my corner rounder to make the scalloped circle. Another card before the night's through. I was in the mood to watercolour something, which was the whole reasoning behind getting this set. 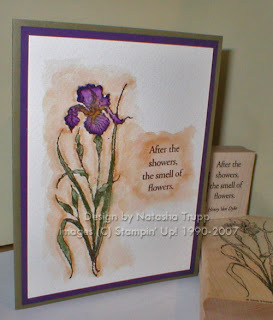 Also, it had an iris stamp and a carnation stamp, 2 flowers which I enjoy. Anyway, I stamped the image onto the watercolour paper with the brown stazon, then started to colour. It's amazing how much better the colour moves on this paper, also no pilling, which is very nice. I kept the card very simple. The images in the Still Life Stems set work very well with a greeting and empty space. I finished it off by mounting it on eggplant, then on thyme. I thought about adding ribbon, but it just didn't go, so I left it. I think I will definitely be making a set of these as a gift item sometime. Also, in regards to the giveaway, stay tuned. Once my weekend starts (sometime after 4:00 tomorrow), I will post the items! Here's a quick card showcasing two of my new sets. I'm not a huge dog fan, but the dogs in this set are pretty cute. Plus they are good for colouring in. I also used linen on here. Also pulled out some of my 12x12 paper. This paper isn't diagonally printed, but the nice thing with striped paper is you can use it however you like, and I wanted diagonal stripes here, so I cut my paper accordingly. 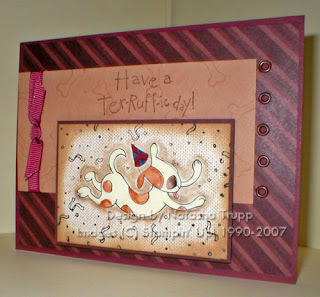 This card's layout is based on this week's sketch challenge. It's not my favorite most card, but I'm just warming up. I had a few days of none stamping with all those sets just taunting me. By the way, I've mounted everything but the numbers and alphabets. My bandaids did wonders!! Woot, my stamps arrived!! They were sitting happily on my doorstep when I got home. 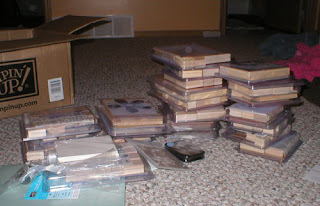 I guess you are all wondering what I got...Well, here's the picture of ths stacks of stamps. The leftmost piles are all the freebies (Happy Harmony, Delight in Life, So Delightful, Big Blossom, So Very, Very Punnyx2, Bothway Blossoms, Sage Shadow, Pumpkin Pie Reinker, Finest Flourishes brass template, watercolour paper). The other piles are categorized into alphabet stamps and other stamps. I got Headline Numbers, Letterpress Numbers, Typeset Upper, Typeset Numbers, and Short Order Numbers. Of other sets I got Brighter Tomorrow, Beautiful Beach, Balmy Breezes, Ruff Day, The Cat's Meow, And Everything Nice, Still Life Stems and Finest Flourishes, as well as Weathered and Linen. So here's the stac k of all my "presents". In other amusements, check out my gifts from my parents. Seriously, she wrapped these before I did yesterday's Colour Challenge! Isn't that crazy?? In other hilarity, I was checking out my SCS private messages, I got a few birthday greetings, etc, and then after I finished checking them, this appeared. That's right 65535 messages. What a birthday! Apparently 50% of the SCS population felt the need to wish me so (not!). You can only have a maximum of 350 messages, however I found this absolutely hilarious, considering it's my birthday. Can you imagine, having 65,000 people pm you in one day?? I checked out today's colour challenge, loved this bright colour combination! I started out embossing the gable green piece. 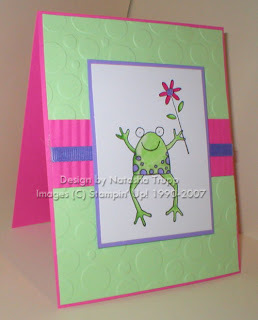 I wanted to replicate the tiny bubble cuttlebug embossing folder. I did this by using various smaller sized circles. Once I had this done, it screamed FROG to me, and I was a bit sad since the little frog from Very Punny would've been darling on here. But then I started going through my animal set, and I came across this one. I totally forgot that I owned Unfroggetable. Perfect! So it came together from there. In my other news, my stamps did not arrive today. It's kind of frustrating, to know that they've just been chilling at the UPS place at the airport since 7:00 PM Monday. On the other hand, my "birthday package" should actually arrive on my birthday then, which is cool!! Unfortunately, we already have plans in the evening (out to a play), so sadly, not much time will be available for playing until Friday (got plans Thursday too). I had even bought bandaids in anticipation of mounting 21 sets. I know people absolutely rave about the SU! scissors, and yes, they cut the rubber AWESOMELY, however, after one simple set, I've got the makings of a blister. I guess I cut funny? The larger handles instead of providing extra comfort cause a great deal of pain. I was thinking I'd like to do another giveaway, it'd be cool to reach 20,000 on my birthday, then it'd be like a double occasion. However, I have no idea what to give away... I'll have to get back to you. Would there be interest in something I've made?? 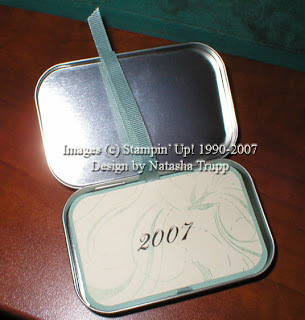 Say, an altoid tin calendar?? Or something else? Yeah, bad title, I know, but I couldn't help it. I've been in the mood to make a gel card for quite some time. 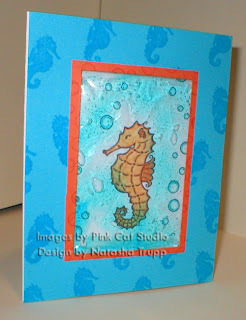 This seahorse stamp by Pink Cat Studio worked nicely with the size of bag I wanted to use. It's a pretty simple card as far as layout goes, but when you make gel cards with the focal point so big, there's not really a need to add loads of layers or accessories. 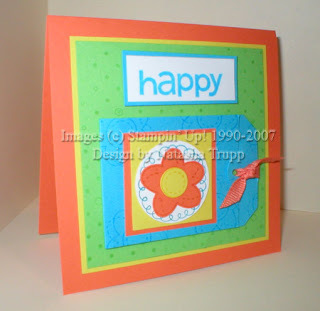 Here's a quick and cheery card. I was inspired by the layout on the cover of the Sell-a-bration catalog. I also decided to go back to bold brights. This was the first colour family I had, and I am generally just a bright kind of person. 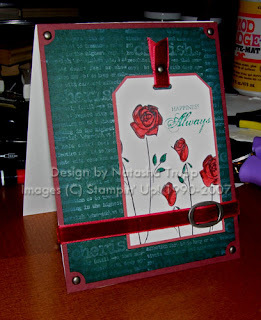 I created the little turquoise tab/tag using the slot punch and the tag corner punch. Inside there is a message that says "take joy in the little things". I'm actually somewhat proud of myself, usually when I know I've got stamps coming I kind of fall into a bit of a slump, but not this weekend. I kept stamping and also keep getting super excited about my SAB order. It's my birthday in a few days, so I planned my order so that it would arrive right around then. The UPS website says it is due to arrive on the 10th (my birthday), but it should arrive in Winnipeg tomorrow, which means a Tuesday delivery. I've got so much stuff coming :D I made my list and revised it about 17 times since December. I decided to complete some of my alphabets by getting the matching numbers. Also, I noticed a serious lack of line art in my stamp collection, so I've got lots of those coming. I'll post a list and maybe a picture of me and my stuff once it arrives. Amy and I've been determined to use them. I was somewhat inspired by her prima covered B . I've had this small frame from the Christmas Slab just sitting on my desk for the past few weeks. Tonight was the night I was going to finally do something with it. It was sitting right next to the primas and the mod podge, it would seem that it was meant to be. I started just with 2 colours, the purple-ish primas, then filled out the empty spaces with the two browner colours. I also podgied the back of the frame to reinforce all of those flowers. So I had this fabulous frame, but now what?? I scanned all my stamp sets and decided that this image went nicest inside, especially when complimented with a greeting. Next, I went into my box'o'ribbon from Jody's ribbon swap, and what do you know, another match (it matches one of the prima colours). Now, all I needed was paper! I first got out pale plum and perfect plum, since I had used those inks, but it just didn't go. Then I looked at the Enchante papers, again, it wasn't quite right. Finally I rummaged through my textured cardstock stash (I wish it was bigger, I don't know what I was thinking only getting 1 colourwheel pack for 7.99 US when I was in Fargo this Summer). I pulled out this burgundy colour and a tan colour. They seemed like nice compliments to the frame. I couldn't leave them blank, but I didn't want to add too much, I wouldn't want to take away from that prima frame. So, that's my story, this is what happens when I stamp past midnight, I feel the need to share ever excrutiating detail of my creative process with the world. So I had this idea to make a purse sized calendar in an altoids tin. I am happy to report that it actually came out exactly as I had envisioned, a truly rare occurence. First of all, in case you are unaware, the font that matches the sentiments in Carte Postale is a free downloadable one called Porcelain. I used that here to make my fancy calenders. I used Publisher's wallet size calendar template (which happens to measure 3-3/8x2-1/8). I was thrilled to find out that these were the perfect size for putting in the tin. I mounted each month on a 3-1/2x2-1/4 piece of Sage Shadow. Then I coloured a very long piece of white grosgrain since I don't have any Sage reinker. I used the long piece of ribbon to attach all my little calendar pieces. It worked out incredibly well! I did this one piece at a time, never cutting my tape, just doing it all in one long piece. I used 7 pieces of the Sage Shadow, since I wanted a "title page" so to speak. I also finally cut into my Enchante paper . I've had it since mid-December. I opened it immediately, but I just couldn't use it, until now. I also used plenty of corner rounding here. 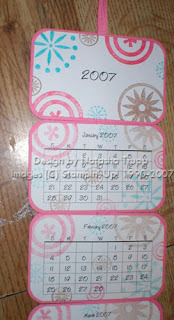 I decorated each calendar with a Sage stamped off image of French Flair. This allows the calendar to still be legible while being pretty. The "title page" has the year in big numbers on one side, and a place to write your name, address, and phone number on the other. It was actually a relatively simple project, but definitely easy to do show and share. I did this to get myself ready to do the 3-D portion of the Artisan Award. I haven't yet decided what I am going to do (and once I do, unfortunately I will be unable to share it), but I wanted to play around with a few things. I usually stick to cards, so I need to give myself warm up activities for the 3-d and scrapbook components. I still had these colours hanging around on my desk, so I thought I'd continue with them. I actually started this card yesterday. I was really hungry, and was totally in the mood for popcorn. I didn't feel like making any, so I went with the paper kind. I thought the "admission" stamp from Stamp of Authenticity went well with the movie theme, so I incorporated that into it. I made the admission look like a ticket by punching all around it with my 1/8 handheld punch. 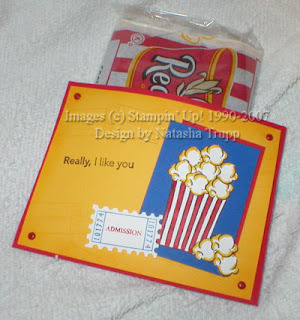 I wasn't originally planning on making this into a popcorn holder, but the nearest red scrap was already pre-cut and scored into a pocket card (past workshop remnants), so I thought, why not! It was also very convenient that the package of microwave popcorn I found had the same colours. I really liked this sketch challenge. It definitely gave me a layout that I know I've never done before. I traced a roll of tape to make the half circle. Then carefully trimmed the black piece underneath to make an even mat. The summer sun piece is dry embossed with the seeing spots template. The part with the big and little pieces is mounted up on some dimensionals. I love these colours (Caribbean, Black & White). This was today's colour combination, so I wanted to make something once I checked it out. I used a hostess set: Reason to Smile. I had yet to make something I liked with it, so I was determined to make it work. There are a few design features I would change, however I am pleased with it. I also used All in a Row, another set that I am determined to use more. It works really well for adding that little extra border on almost anything. I received some Jolee's Boutique stickers for Christmas. They are the type of item that catches my eye in the store, but it's something I would never actually buy for myself.I like to use them as inspiration, a challenge of sorts to see if I can recreate the look. However, since I got these ones as a gift, I might as well use them!! I saw this layout done earlier this week, and I thought it would work great for so many things. 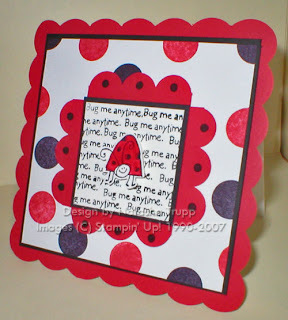 It's great for using up those small bits of patterned paper and smaller stamped greetings or images. I dug deep into the 12x12 paper stash, and pulled out this paper from Slab 4 (I think...). The butterflies and flowers are the stickers. The greeting circles are all mounted on dimensionals. The card measures 5x5. This layout is great if you're crunched for time. It takes about 5 minutes.